Christophe Riblon won stage 18 of the Tour de France on Thursday in Alpe d’Huez. Riblon (Ag2r La Mondiale) attacked his way out of the day’s long breakaway and closed a late gap to Tejay van Garderen (BMC Racing) to secure France its first victory in the 100th Tour. Van Garderen was second, at nearly a minute, in the 168.5-kilometer stage from Gap. Moreno Moser (Cannondale) was third, at 1:27. Chris Froome (Sky) overcame a late bonk to defend the overall lead. The race leader lost contact late with best young rider Nairo Quintana (Movistar), but was able to limit his loss to just more than a minute. The 168.5km epic featured six categorized climbs, starting with the Col de Manse, which kicked up just 6km from Gap, and finishing with two climbs of the hors categorie L’Alpe d’Huez separated by the climb and harrowing descent of the Cat. 2 Col de Sarenne. The queen stage of the race’s 100th edition was the first time the Alpe had ever been climbed more than once during a single stage. A nine-man breakaway began to form on the Manse and established itself in the 70km between the summit and the foot of the Cat. 2 Col d’Ornon: Jens Voigt (RadioShack-Leopard), Arnold Jeannesson (FDJ.fr), Andrey Amador (Movistar), Sylvain Chavanel (Omega Pharma-Quick Step), Lars Boom (Belkin), Tom Danielson (Garmin-Sharp), Riblon, Moser, and van Garderen. The escape took a maximum advantage of just over eight minutes. Saxo tried to lay the foundation for an attack by second and third overall Alberto Contador and Roman Kreuziger when Nicolas Roche and Sergio Paulinho attacked ahead of the first ascent of the hors categorie L’Alpe d’Huez. Roche couldn’t hold the pace, however, and Paulinho was alone onto the climb between the peloton and the breakaway. Soon, both Saxo men were back in the bunch. Van Garderen was the first to attack from the breakaway, going solo low down on the climb. The American rose up the 21 lacets of the climb, eight minutes-plus ahead of the peloton the entire way. Riblon and Moser closed down on the American as the three of them passed through the village at the top of the climb and rolled toward the foot of the Cat. 2 Col de Sarenne. Mikel Nieve (Euskaltel-Euskadi), Wouter Poels (Vacansoleil-DCM), and Europcar’s Pierre Rolland and Thomas Voeckler went on a KOM mission, attacking the peloton. In an attempt to dislodge Froome from the top of the mountains classification, the quartet set out to battle for the final mountains points on offer at Alpe d’Huez and the Sarenne. Back in the peloton, Andrew Talansky (Garmin-Sharp) attacked alone with 6.5km to go on the first passage of the Alpe. The acceleration brought no reaction from Sky, but the American wasn’t able to shake the group. Andy Schleck (RadioShack-Leopard) was the next to go, attacking with 5.5km to go on the climb. Voigt remained ahead, trailing the Moser group, giving Schleck a teammate up the road. At the front, Moser’s pace dropped Riblon, van Garderen held up on the Frenchman’s wheel. With 49km to go, the Italian was alone at the front. Voeckler pulled Rolland and Co. for 2km before losing contact. Schleck joined in, however, and the reshaped four-man group continued on. David Lopez set a consistent pace for Froome as the yellow jersey group rolled into the village. Up ahead, Riblon and van Garderen rejoined Moser before the climb of the Sarenne. Behind them, Nieve, third in the classification but wearing the polka dot jersey, attacked Rolland. Moser lost contact with Riblon and van Garderen and went back to Voigt. Van Garderen was first over the stage’s penultimate summit and the pair led onto the technical descent of the Sarenne. Moser was closing when the American suffered a mechanical and was forced to stop for an adjustment. with 38km to go. Van Garderen lost 50 seconds to the mechanical. Danielson trailed Voigt, but was ahead of Boom, Jeannesson, Amador, and Chavanel. Behind them, Schleck, Nieve, Rolland, and Poels summited the Sarenne and began the descent, more than six minutes behind the leaders. Riblon overcooked a damp corner in the trees with 34km to go and rode into the deep grass and trees to the right of the road. The Frenchman avoided a crash, but lost contact with his Italian counterpart. As rain began to fall on the leaders lower on the descent, Contador accelerated past Lopez, Kennaugh, Porte, and Froome. By the exit of the next switchback, 300 meters later, the Spaniard had a gap. Contador and teammate Roman Kreuziger, third overall, were quickly out of sight on the winding descent. Kreuziger led the two-time Tour champ over mostly dry roads. Riblon rejoined Moser at the front and the pair led van Garderen by a half-minute with 20km to go. The American completely erased the gap with 17km to go and the three of them aimed for Bourg d’Oisans and the final climb of the Alpe. Behind them, Contador saw trouble of some sort and went from leading the yellow jersey group to chasing on from behind. He rejoined from the caravan with 18km to go. Van Garderen pulled the leading trio onto the climb and Riblon jumped on the first ramp above Bourg d’Oisans. Moser could not respond to the acceleration and quickly lost 10 seconds. The American closed on the Frenchman and Riblon looked over his right shoulder to see van Garderen. Van Garderen looked back 1km later and could no longer see the Italian. If he could, he would have seen Voigt drawing even with Moser. Movistar led the yellow jersey group to the climb more than five minutes after van Garderen and Co. The Spanish team of best young rider Quintana upped the speed as it pulled into the base of the the Alpe. Van Garderen accelerated with 12.3km to go, Riblon pasted to his wheel. The Frenchman could only hold on for a moment, however, and the American was soon alone, 4:30 ahead of Froome. Riblon fought the thoughts that he was riding for best of the also-rans. Back in the yellow jersey group, A foursome attacked. Fourth overall Bauke Mollema (Belkin) and Alejandro Valverde (Movistar) was among the attackers, but Sky would let them go nowhere. Froome countered and rode across to the four riders. Porte pulled through soon after, taking up the pace making. Froome accelerated again with 10km to go. Porte slowed, Joaquim Rodríguez (Katusha) on his wheel, and the race leader had a gap. Quintana bridged across; Kreuziger and Mollema could not hang onto the chase. Five riders pursued the maillot jaune: Rodríguez and teammate Daniel Moreno, Contador, Valverde, and Porte. Rodríguez and Moreno jumped across toward Froome and Quintana, leaving the other three behind. Moreno launched “Purito” onto the back of the yellow jersey and was finished. Froome appeared under pressure with 9.5km to go and Quintana went to the front. Rodríguez then went to the front and kicked, putting Froome at the back of the three-man group. Behind them, Valverde and Porte left Contador and pursued their team leaders, but the Katusha man wouldn’t wait for them, attacking with 9km to go. 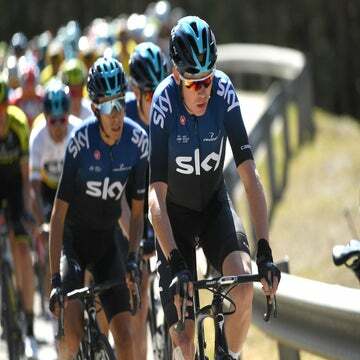 For the first time in this Tour, Froome appeared under pressure when Quintana chased Rodríguez and dispatched the yellow jersey. At the front, van Garderen struggled to turn the pedals, his gap to Froome holding at 4:15 with 7.3km remaining. With 6km to go, the American led Riblon by 37 seconds. Somehow, Froome drew even again with Quintana and the Colombian neutralized Rodríguez’s advantage. Porte made his way across, but Valverde could not. The Australian pushed the pace to a level that put Froome into difficulty for a moment, but backed off when the race leader called him off on the earpiece. Behind them, Kreuziger rejoined the Contador group and went to work at the front, trying to limit the Saxo pair’s losses to Froome. With 5.3km to go, van Garderen’s lead was up to 44 seconds. As he rolled under the 5km banner, van Garderen continued to push, rocking his shoulders over his handlebars. He came to the 100th Tour de France aiming for the general classification, but after 2.5 weeks, van Garderen found himself riding for a stage win on the race’s most iconic mountain. With 4km to go, van Garderen held 36 seconds. Further down the climb, Froome bonked. He called for a feed, but feeding was closed. Regardless, Porte went back to the team car — which Sky claimed had had a problem and been unable to feed the team since the Sarenne descent — and returned with three gels for his captain. Quintana took the bit and attacked. The Colombian was quickly out of sight. Rodríguez tried to follow, but was 10 bike lengths behind. “[It was] not a huge setback. I think myself and Richie … Richie was definitely feeling a lot better than I was today. I was running low on sugars and had to send him back to the car,” said Froome. Rodríguez closed on Quintana and, four days after being beaten back on Mont Ventoux, the pair rode away from the race leader. Up the road, Riblon began drawing van Garderen in. With 2.5km to go, the gap was down to 14 seconds. The Frenchman could see his prey. Riblon drew onto the wheel of the American with 2km to go and immediately countered to his right. Van Garderen could not respond to the vicious attack; his bid for victory was finished. Riblon rode across the line in Alpe d’Huez pumping his arms in celebration. The win came a day after his team captain abandoned the race with a broken collarbone. Van Garderen finished a minute later. “It was very unfortunate when we lost our team leader yesterday, Jean-Christophe Peraud, and we said this morning at the briefing that we’ve got to stop thinking about that and carry on,” said Riblon. Moser came through third, and Quintana sprinted past Rodríguez for fourth, 2:12 behind Riblon. “I still haven’t won a stage yet but I’m very happy with my performance today,” said Quintana. A minute later, Froome led Porte into the final corners. The Australian pulled alongside his captain, talked to him, and went to the front. The pair crossed the line 3:18 behind Riblon and 1:05 behind Quintana. Contador was next to the village, with Astana’s Jakob Fuglsang and Nieve. The Spaniard ceded nearly a minute to Froome. Kreuziger followed almost 20 seconds later. The Tour de France continues Friday with the 204.5km 19th stage, from Bourg d’Oisans to Le Grand-Bornand. The stage features five categorized climbs, including the HC-rated Col du Glandon and Col de Madeleine, as well as the Cat. 1 Col de la Croix Fry, the summit of which lies 13km from the finish.